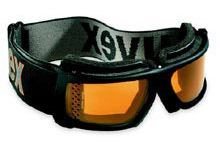 There are hundreds of different goggles available for skiing and snowboarding. I have used many of them, from cheap no-frills models to rather expensive models. Here are some of my favorites. Under most circumstances, you won't be wearing goggles when climbing. However, for times when the winds are really blowing, or when you are climbing through spindrift avalanches, goggles are a necessity. In choosing goggles for climbing, I value compact size and resistance to fogging more highly than other features such as superior field of vision. That's because when I'm climbing, I'm always concerned with weight and space in my pack. Also, when I'm climbing, I am wearing a climbing helmet, and I've found that many large profile ski goggles tend to interfere with the fit of a climbing helmet. Lastly, the goggles must have good fog resistance because climbing can be quite strenuous, which means that the goggles need to be able to vent well. The UVEX "Pocket" goggles are the best climbing goggles I've ever used. They are the only goggles I know of that have a hinge at the nose-bridge, which allows them to fold up into a very compact package when not being used. (Most goggles are very bulky, and take up a lot of room in your pack.) The low profile design, and the hinging feature make them great for climbing trips, where pack and pocket space is always at a premium. They vent well, and provide good eye protection. Field of vision is good. The frame doesn't extend too far above the eyebrows, so they don't interfere with most climbing helmets. These are my climbing goggles of choice. 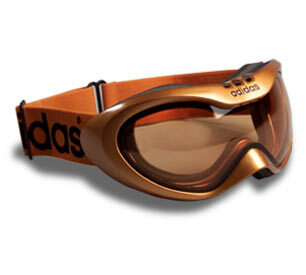 The "Robin" goggles by Addidas are an example of an excellent ski goggle design. They have a very bulbous wrap around lens that provides truly panoramic peripheral vision, and very good up and down vision as well. They have very well vented double lenses, so they don't fog, and their full coverage provides good wind/snow/sun protection. They look a little bit funky and bug-eyed, but the bulbous, curved lenses really provide a great field of view. They are low-profile enough to work well with my ski helmet (Giro "9") . The lenses are easily replaced, and replacement lenses are available if you damage your original lens. I've used a number of high-end ski goggles, and the Addidas is my hands-down favorite.